Zoho Mail Streams enables communication and collaboration within a team or group of people. It enhances the productivity of the team through open communication, reducing the email replies and forwards thus avoiding email clutter within teams. A Streams Group acts as a virtual bulletin where any message/ information that needs to be passed on to all group members can be posted. With the inclusion of likes and comments, Streams enables structured discussions around the posts in the group. It helps keep all group members in the loop. You can also post to individuals, for private/ one to one discussions. The 'Streams' enabled Groups will be listed in the left pane. You can select a group to view and participate in the activities of the group. Streams enables social media style interaction within teams/ groups facilitated by likes and comments for different entities, which can be shared with groups or individuals. A moderator or an Administrator can enable Streams for the group. Once the group is 'Streamified', all the members can view it under Streams Groups listing on the left pane. Once enabled, the members can start posting messages to the groups. The users can also add posts directly to individual members' walls. Group Streams will have the activities and shares in Streams for the particular group. Any individual posts or shares will be available in the 'My Streams' area of the Home. The users can 'Like' a post or a comment, by clicking the Heart icon of the post/ comment. A like to the post/ comment can be interpreted as an agreement or a positive nod to the post. The owner of the post/ comment will receive notifications whenever someone likes his/ her post or comment. 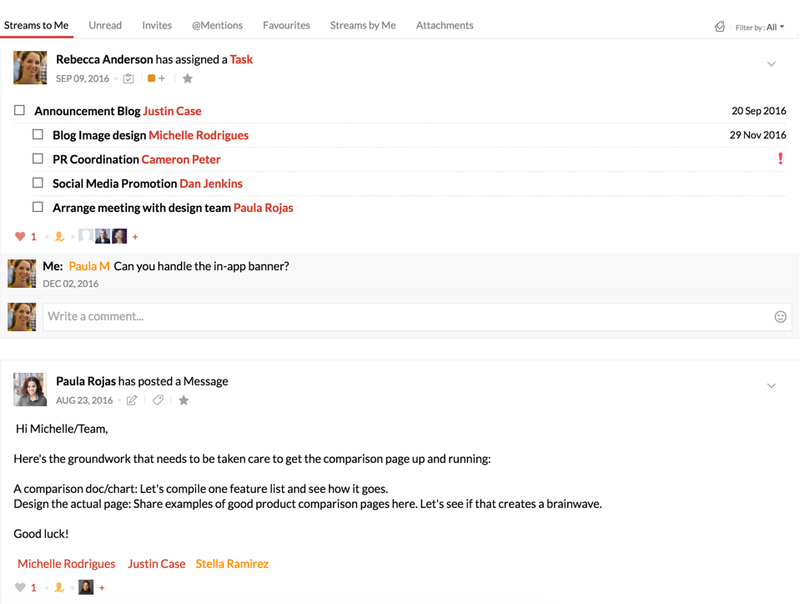 Comments help the users to provide their feedback instantly in a quick and simple manner. You can @mention other users in the Comment area to add them to the discussion or to notify them about the discussion. It can also help you to get the feedback from someone in particular or to pass the ball to someone about the particular topic. Your Streams page can be viewed in two different layouts, namely, the Social view and the List view. In the Social view, your posts will be listed in a social media format. The options to comment on a post, invite members, like a post etc. will be displayed below the original post. In the list view, your posts will be listed as in email listing. You can click each post to preview it separately. The options to perform actions on this post or view the comments will be provided in the preview pane. After opening your Streams page, locate the Social view and List view icons on the top right corner of your page. The selected view will be highlighted. Click the desired view to change your page's layout. Members of the group can post statuses or messages in the Streams group. This can be used when there is an information that needs to be passed on to the entire group. The members can Like or Comment on the Status. They can @mention another member of the group in the Status or invite new guests to the posts, based on the permission level set for the post. The rich text editor provides many options using which the message content can be formatted. When a URL or a web link is added to the post, a preview is generated as a part of the post. The status can have attachments or have embedded videos and so on. The members of the group can schedule events for the group members in the Streams Calendar. If the 'Invite all group members' option is unchecked, only the attendees mentioned by the event creator will be invited to the event. The Events can be some team meetings or some external events which can be of importance to the group members and so on. The members of the group can post updates about the meeting or the outcome as comments for reference or for further discussions. The Group members can also add certain external events of common interest to the group, in the Events area. Ex: Webinars, TED Talks, Tech meets and so on. Group Tasks under Streams help to create visibility about the common tasks, task owners, and progress of the tasks among the members of the groups. The members can post Tasks in Groups, set priorities, assign it to someone and further create reminders and set due dates for the tasks. The Task can also have related attachments added. The group Task can be further split to subtasks and each subtask can be assigned to a different person. The members can like the Task or comment on it to share their feedback. The owner of the Task can mark the task as complete or change the due date and add reminders. This helps the individual members and the group to have an overall idea of the upcoming, pending and completed tasks, deadlines and others feedback about the tasks. You can add any Web URL as a bookmark in the Streams group for the other members to view. The title and the description of the URL are automatically filled in the respective fields. You can choose which streams group you want the bookmark to be a part of from the drop down at the right bottom end. If you have different collections in your Bookmark App, you can choose the collection you want to add your bookmark to. The added bookmark can be viewed in the Bookmarks App. The members can create common 'Notes' for the groups and post them in the respective Streams page. This helps to have common items pinned in the Group for easy reference. Whenever the owner changes the Note, all the members get notifications about the change. Similar to the other entities all the members of the group can 'Like' or 'Comment' on a note. The members can now add embedded images and attachments to the Notes, to empower Notes as a better collaboration tool for sharing ideas. The other members can comment on the group notes, but cannot change the original note added by the member.